If ever there was a word like that. If not, well, I just created one. Maybe I should copyright it! What say? Ram wanted to cheer me up and he took me to this place as a surprise. We went and tried out some exotic truffles and of course ordered a hot chocolate beverage. Out of their selection of truffles, I liked their Champagne truffles which were yummylicious. I ordered White Chocolate Hot Drink on that cold winter day. Ooh la la….What taste! And to top that, they serve this with a slow burner that keeps your drink warm till you finish. The whole experience gave the feeling of snuggling under a quilt cosily. And Theobroma’s white chocolate, made me want to have White Chocolate Milk more often. With the pretence of baking Peanut butter and White Chocolate cookies for my team, I bought a packet of White chocolate buttons. Shhh……don’t tell anyone….I put some in hot milk and enjoyed it, and kept indulging till it was over in less than 2 weeks. I enjoyed every last drop. It just so happened, I saw myself in the mirror just as I was finishing my last glass of chocolate milk, and saw that I had the funniest milk moustache ever. Just one of those memories that make you laugh just thinking about it. A quaint little chocolaterie nestled in the bustling town of Kerikeri that makes sinfully delectable chocolates in all shapes and sizes. My best pick of the lot is their best seller Macadamia Butter Toffee Crunch. This is a medium sliced slab slathered with caramel butter toffee smothered with chopped Macadamia nuts. One bite leaves you craving for more. You have got to experience this to know what I am talking about. I found this treasure during one of my most memorable trips to Paihia. Another holiday discovery, Chocciato was a surprise find. After an hour and half of gruelling Skiing lessons on Mount Ruapehu, my husband, sister and I trudged on slush, skid on thin ice and climbed up the small set of steep wooden steps to reach the cozy warm Bar & Restaurant that had both indoor and outdoor seating areas. We went up to the counter, and placed our order. All orders except mine were ready quite soon. 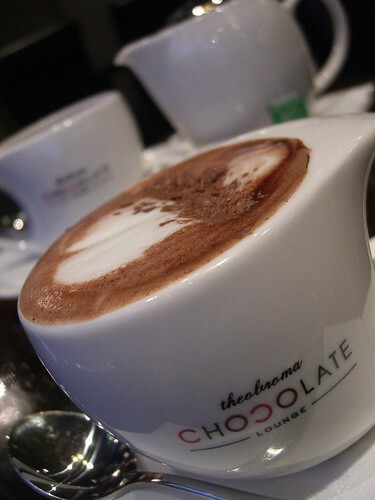 I had ordered this hot drink I saw on the menu called ‘Chocciato’. Didn’t have a clue what it was and I daringly ordered it in the holiday spirit. After waiting for what seemed ages, we finally got our order and we made our way to the benches on the deck with a lovely view of the Mount and its beanie cloud. The air was freezing, my nose had turned pink in the cold air. I grabbed my cup, imagine a shot espresso porcelain cup with no handles filled with thick dark brown liquid, not exactly melted chocolate, but something like a thick chocolatee syrup and hot. I tested the warmth of the hot liquid, and took a tentative sip. Lo behold! The heat and the sweetness combined spread inside my mouth, the sweetness sliding down my throat, and I was under the onslaught of a thousand happy memories. ‘Sigh’!!! And I forgot I was alive. The sensation was so unreal. If you ever get a chance, don’t miss this one for sure. Thanks Divvvy….i always love hearing from u.
Rats…you are right about being chocolate’d…..It was a great experience. Your writing and pics takes me back to refresh those cherished memories. u have recreated a deep longing for chocolates. i love anything and everything chocoletty. but i can’t do that anymore.